Armor Piercing Arming Sword: with either a diamond or hollow ground profile, Type XV swords were typically stiff, long and extremely pointed blades designed to pierce maille and the weak points/joints in plate armor. 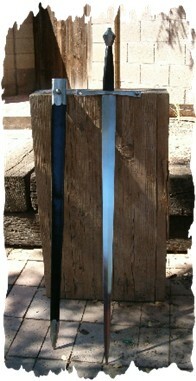 While any crossguard from the period could be used, type 8 (pictured) was the most common for a type 15 sword. In use from the 14th to the 15th centuries, but somewhat specialized in its use. 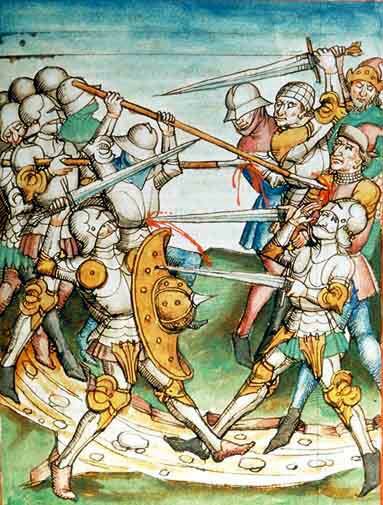 The Oakeshott Type XV sword was developed during the arms race raging during the 14th and 15th centuries. While previously the swordman only had to content with maille, helmets and shields, more and more metal plates were being introduced until - by the time a sword like this was needed - plate armor was in full swing, making a knight close to invulnerable from normal cutting and cut and thrust orientated swords. While this type of sword CAN cut, it discards the cut in favor of its specialty and primary use on the battlefield. And that use was to seek out, pry into and pierce in between the gaps of knights who were effectively like walking tanks. And so the relatively narrow blade is made with either a reinforced diamond cross section or hollow ground and tapers strongly to a long, dagger like needle pointed tip. 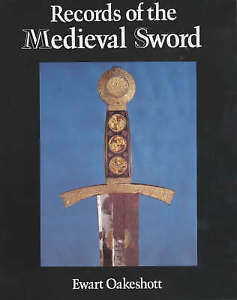 You would think that considering this type of sword was quite a common sight on the medieval battlefield for around 200 years, as well as the number of this type that are in museums, that there would be at least a few replicas of this sword type. But alas, that is not the case. Even ahistorical sword makers have not really anciently used this quite distinct blade profile for a one handed sword - and the few attempts made, such as the discontinued Shrewsbury Sword (pictured left) - had to be discounted to under $100 to liquidate it. As such, it suggests that, among modern day medieval sword collectors and enthusiasts, a sword specialized to tackle the problem of plate armor was just not something they were willing to fork over their money for. Thankfully, for those few who do appreciate this unique style, there are 2 functional replicas on the market - but only 2 - and both are made by Del Tin of Italy. For some collectors, the fact that Del Tin's swords do not come sharpened is a deal breaker - but for a type XV like this one - all that really matters is the tip, and this sword - also known as the DT-2150 - has that in spades. A beautiful and accurate type XV. Don't let the short fuller on this sword throw you, this is still most definitely a Type XV - and the last one of its type that is historically accurate currently available in the sword market. Also known as the DT-2153B. MyArmory has an excellent in depth article on Type XV swords here which explains their history and lists some high end reproductions and images of actual antiques.